A suspect being sought for assault with a deadly weapon was fatally shot during a confrontation with Anaheim Police just after 9:00 pm Saturday night. Anaheim police officers were assisting officers from the California Highway Patrol in searching for a suspect who had attempted to ram one vehicle and successfully rammed another vehicle on the 91 freeway near East Street. The suspect vehicle, a 2003 Honda Pilot, was disabled after it intentionally rammed a Honda Accord on the freeway. Two males were seen fleeing the scene on foot. The original assault with a deadly weapon is being investigated by the California Highway Patrol. Witnesses directed APD officers to the courtyard of a residence in the 1300 block of N. East St. Officers contacted a possible suspect in the courtyard and an Officer Involved Shooting occurred. The suspect, a 29 year old male, was struck by gunfire at least once. Officers immediately began performing lifesaving efforts and the suspect was transported to the hospital, but was pronounced deceased upon arrival. Investigators from the Orange County District Attorney’s Office are on scene leading the investigation. 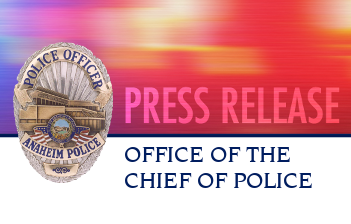 In addition to the DA’s office, personnel from the APD Homicide Detail, Major Incident Review Team (MIRT), and the Office of Independent Review (OIR) are conducting concurrent investigations. The officer involved in the incident was wearing a Body Worn Camera which was activated at the time the shooting occurred. The suspect’s identity is not being released pending notification of next of kin. No further information will be available before 12:00 pm Sunday afternoon.